Theorizing a New Agenda for Architecture: An Anthology of Architectural Theory 1965–1995 recoge en un solo volumen los ensayos más significativos sobre la teoría de la arquitectura durante el período 1965-1995. Un período dinámico de re-evaluación de la disciplina, una era postmoderna que produjo puntos de vista ampliamente divergentes y radicales sobre las maneras de construir la historia y la ciudad. 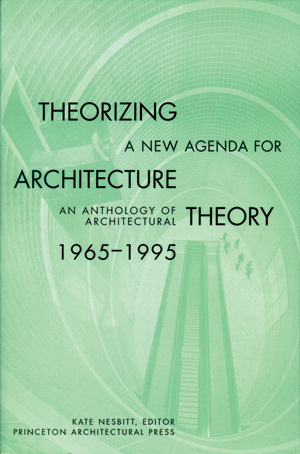 | Theorizing a New Agenda for Architecture: An Anthology of Architectural Theory 1965–1995 collects in a single volume the most significant essays on architectural theory during the period 1965–1995. A dynamic period of reexamination of the discipline, the postmodern era produced widely divergent and radical viewpoints on issues of making, meaning, history and the city.